On the 24th May 1941 at 05.53hrs H.M.S. 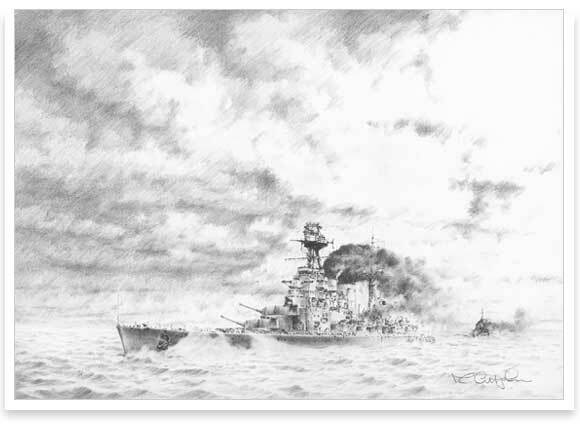 Hood and the Prince of Wales opened fire upon the surprised German warships the battleship Bismarck and cruiser Prinz Eugen, who had been attempting to breakthrough to the North Atlantic convoy lanes. A combination of events meant that Admiral Holland's plans to cross the German "T" had failed and in fact it was the Germans who held the upper hand in regard to positioning. H.M.S. Hood although the prize of the Royal Navy was an elderly battlecruiser not designed to slug it out with a major modern capital ship such as the Bismarck, indeed the more modern Prince of Wales battleship was still undergoing workup and had technical problems with its main guns. Within minutes the Germans had returned fire and already bracketed the Hood, a shell believed to be from Prinz Eugen set the boatdeck of the Hood ablaze, and as Holland attempted to turn to port to bring his rear guns into action a shell from the Bismarck penetrated the ship and moments later Hood disintergrated. The Hood sunk at 06.02hrs there were only three survivors rescued from its crew of nearly 2500 men. The Prince of Wales badly damaged during the engagement and with one of its main turrets out of action due to a technical fault withdrew. Bismarck would herself be sunk only days later, after virtually every available British warship in the Atlantic was ordered to intercept and destroy her.